Every workout you do needs to have some kind of focus. Whether it be technique, speed, a specific energy system, heart rates, effort, recovery… you need know what you are doing and why you are doing it. Without focus, you’re not getting everything you can out of your training. If a person is told to do ten 50s freestyle on the 1:15 or :15 seconds rest, what does that mean? 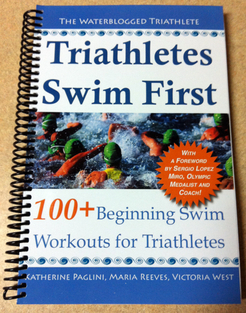 How does that help a beginning athlete who is coming in on the 1:14 or 1:13? How does it help an experienced athlete who can hold :35s with little effort? The beginning athlete is probably struggling with lactic acid build up, which is a completely different energy system than the experienced athlete, who might be getting too much rest to help their aerobic base improve. The workout is the “same,” but both athletes are getting two different workouts out of it because the instructions are too generic. It is okay to ask what your target heart rate should be. Don’t be afraid to find out what the goal of the set is. If the workout you are doing doesn’t ask you to focus on something specific, either use the resources around you or put the onus on yourself and pick something. Don’t be afraid of focusing on the wrong thing because there is no “wrong” thing. The more you think about what you’re doing at practice, the less you have to think about it during a race. Are you getting everything you can out of your water practices? This is one of my favorite posts – from way before we had many readers. It is important to understand the focus of a main set, a drill, a piece of equipment. A lot of workouts are too generic because they aren’t written for the person who’s doing them. Without focus you might be using the wrong energy system or forgetting about technique. If you have a coach, you may not understand how the workout is tailored to you but you can always ask them “why.” In my experience, coaches like to answer such questions because it shows that you care about your training. If your workouts have a focus, you know you are always getting something out of them. Be informed. Take time and be focused when you swim!! !